Internal linking is one of the basic fundamentals of any SEO project, but it is also something that I see done wrong on a daily basis. It is an area that if done incorrectly, it can lose you money and sales. If customers are confused by internal links or they can’t find the page that is going to make you money, they are not going to convert to sales. 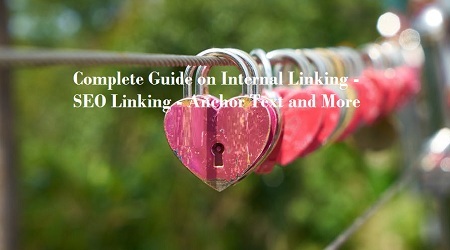 The most common thing people do using internal links is to link back to the page that you are already on. Now the problem is that customers are not stupid, if they click a link that takes them back to the page they are already on, it’s going to confuse them, or they are just going to be annoyed that they have been sent back to the same place. Yes, it is good for SEO reasons, but there are better ways to get that benefit without resorting to spamming links back on yourself. So don’t do same page links. In fact, it’s just as beneficial to have a link from another page pointing to that page with a link, than to link from the same page to itself. You should definitely have anchor text links. They are a great way to give relevance to the page that the link is being passed on to, and if you include the keyword, then it ties up the two nicely. It goes wrong when you have too many keywords in an anchor text link. If you have gone past four keywords, you have probably gone too far. You want to give a little bit of information on what that page is about, but don’t go including a super long tail keyword in there. Don’t have long anchor text links. You should definitely give customers the ability to filter the search results that they see on your website, but the search engines don’t necessarily need that information. They should already be able to find the pages on your site through a site map. So have filters, but don’t make them indexable by the search engines. An excellent way to put your blog information so people can find it easily and read it later is to have categories. Don’t put every blog post into multiple categories, because that defeats the point, and also don’t let search engines index them, because they are already going to see that content in your RSS feed and by the blog itself. In terms of an HTML site map, that is a common way of telling users and the search engines what all of your pages are and it does not have to be HTML. It can be whatever format the site is coded in. The important thing is that there is a page somewhere where people can see all of the pages on your site. Now you may have hundreds of pages, in which case don’t put them in a big ugly list. Tab the pages, have them hidden with plus and minus symbols so people can use it. Don’t just have this page as a dump of content for the search engines. If you can make your site map useful for customers, then they will use it. Yes, have a site map. Of course, an XML site map is another way to get your internal links picked up by the search engines. How quickly can customers get to the page on your site that are going to convert them. If it is more than three clicks away, you are going to start losing them. If you can put it in your navigation itself, so they can get there really quickly, that is going to help you out. So have navigation, and if you can put a drop-down menu on there, that’s great. Don’t flood it with too many pages. Make it clear where they need to go and what they need to do, and you will improve the revenue that your site creates.